Works must meet the following conditions to be nominated. Be a work of Science Fiction or Fantasy, or related to Science Fiction or Fantasy. The majority of the work is by a person or a group of people who were born in, or are a citizen of, a European Country (Appendix 1). The works were first released in the two calendar years prior to the year of the current Eurocon. 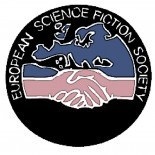 If a work has won an ESFS Achievement award, it can not be nominated again in the same category. The nominations must reach the Chair and the Awards Administrator at least one month before the opening of the Eurocon. Nominations shall be made for a country, by representatives of that country. When out­ of ­country nominations are made, they shall be subject to a veto by delegates from the country concerned. Time shall be given at the general meeting for delegates to present on their nominations. This time will be set by the board of the ESFS. Each country will have equal time. These Awards are granted by vote of European delegates at the business meeting of the ESFS at a Eurocon. A Delegate may only vote for a single nominee in each category. These awards are granted according to the nomination from the national representative to a writer or artist from a European country, who has emerged in the last three years. The winners will be given a certificate signed by the Board of the ESFS. The Awards are plaques or other symbolic objects and are presented by the Chair or another Committee Officer appointed by the Chair. The winners will also be given a certificate signed by the Board of the ESFS. Each category shall only won once by a nominee. Grand Master is for outstanding figures in European Science Fiction. They should have been internationally prominent in the field for at least 20 years and subject to no major controversy. The decision on presentation is at the discretion of the ESFS Board and the convention Organizing committee, with the approval of the General meeting. The European Grandmaster should be presented a plaques or other symbolic object and presented by the Chair or another Committee Officer appointed by the Chair. European Grand Master nominations should not be made public, except by the ESFS board. The ESFS Board shall make the final decision on interpretation of the rules of these awards.